Ughhh. It's that time of year again. This might be an unpopular opinion, so I am sorry in advance. But I hate Coachella. I know- I said I'm sorry. Yes in theory it's all lovely, and I'm sure I'd love to be one of it's young, rich attendees, frolicking in the Californian sun. But I am not one of them. So instead I stare at the English rain through my window whilst googling pictures of said festival and wondering what the hell they are wearing, and just how many more flower garlands I can stand looking at. I almost didn't recognise Stacey from the office under that bandana. She really looks different outside of work. It's not fair for me to say it's just Coachella. Festival fashion in general has become one of the biggest burdens of my generation. Why is it that for three days a year people seem to forget everything they have ever thought about the clothes that they choose to put on their bodies and instead adorn themselves with glitter and paint and flowers with wild abandon. That's not you the real you, Becky- you hate flowers, and have only worn black since 2010. 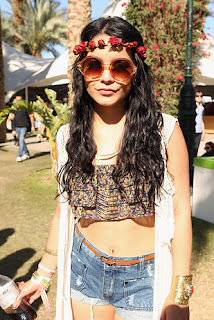 Queen of Coachella Vanessa Hudgens (if you type in Hudgens' name to a search engine the next suggested word is Coachella, need I say more) is one of my personal favourite examples of festival fashion and what it has become. With bindis aplenty and hair so long it rivals Chloe Mafia's hair extensions, (if you don't know- please Google) without fail every year for two weekends in May, Hudgens could resemble a girl from Slough who has popped into her local Topshop and purchased without consideration every single item from the highstreet fave's 'Festival Range'. Love heart sunglasses: check, cut off denim shorts: check, Native American headdress replica: check. Rocking some items that no festival outfit is complete without. And I don't have a solution to this problem. I wish I could say I knew the answer to festival fashion and what one should really be wearing, but I don't. I still make very regrettable clothes choices the minute I enter the festival gates, and am already having sleepless nights over packing for Glastonbury. I can only assume that that this trend for festival fashion was born out of the copious amounts of alcohol consumed in these fields, and I have similarly made a lot of questionable decisions after too much wine from a box, so maybe I shouldn't judge. And until a solution is reached (Alexa Chung and Kate Moss always look pretty bloody good at a festival to be fair) I guess keep releasing your inner Coachella everyone. Stick on those bindis, apply those temporary tattoos and fasten up your bum bag. Just remember to be ready to untag the pictures as soon as they're uploaded to Facebook on Monday.